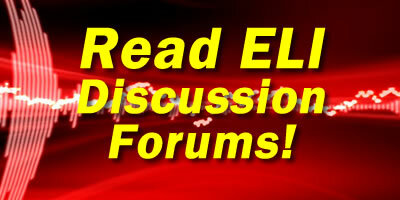 If you have visited the ELI Forums at anytime since March 1, 2013, you will notice that the ELI Forums has never been quite the same since. There is a missing forum, numerous posts are inaccessible, and the main forum is no longer as open and accessible as it once was. In fact, there were cryptic messages by me about a Permanent Protective Order filed against me by the plaintiff for allegedly stalking her. Although I could go into the deeper story, for the sake of brevity, this particular blog post is in direct response to the PDN Online article (written by David Walker) about me and ELI, this website. If anyone reads that article, they will have a natural inclination to follow-up on the matter. Hence, this response article. Let me first acknowledge PDN writer David Walker by saying he did give me the opportunity to respond to the story he was going to write. I wrote very lengthy email responses to his queries, far more material than he could ever use in any single article. The fact that he could not use everything I provided is largely a limitation of news articles. A news article is just that, a summary of the high points as the writer sees it but NOT necessarily the complete story. Mr. Walker promised me he would attempt to be fair and balanced in his approach and writing. While I have some disagreement with the article because some of it is inaccuracies (which I pointed out in a separate email to Mr. Walker), I would say Mr. Walker did his job. Certainly, there is no question that the first portion of the article paints me and this website in an extraordinarily negative light, the latter portion does highlight many of the points I wanted to emphasize. Mr. Walker’s assessment is accurate in that the disagreement between both sides have escalated to a vitriolic levels. I would say that it has evolved to that level because of growing frustrations and anger by demand letter victims. To that, I would say the situation has certainly gotten out of control and steps are being taken on the ELI side to reign the community in. There will be more commentary and response forthcoming. For now, the most expedient way to respond to the inaccuracies of the article is for me to show the email I sent to Mr. Walker early this morning. I read the PDN article you published. I want to say that it appears as balanced as it could reasonably be given the fact that I know all news articles have limited space. You kept your word to me. I do believe you made an effort to keep the story balanced. Thank you for that. But there are a few factual errors I hope you will correct. 1. The plaintiff misinformed you when she says the ISP shut us down. She actually means web host provider. We voluntarily took the ELI Forums down to appease the web host provider. The rest of the ELI website was operating while the ELI Forums was down. We then moved the entire website to another web host provider. I informed Eapps that the problem was resolved and it was moved elsewhere. Given the tensions between myself and Eapps BEFORE the plaintiff’s complaint (which I have documents of), they informed that they wanted to terminate my subscription after my term finished. It was a cordial parting. The full story was written here with the entire email exchange with the web host provider. This is the accurate version, not the distorted, paraphrased version plaintiff provided you. 2. Regarding this quote, “My dazzling, hypnotic, persuasive, and entrancing words and prose are somewhat masterful I must confess. I can convince the most intelligent, self-determined, and self-motivated person to blindly follow any public suggestion I might make.” it was intentionally sarcastic and snarky. Who would actually believe I run a cult, seriously? Does anyone really believe that I actually believe that of myself? Yes, I have an ego but give me a break! No one has an ego that can accommodate the snarky comment that I wrote. Can the average person not tell that I was being snarky? Or are lawyers like McCormack unable to discern sarcasm and snarkiness? That is an example of what I mean by taking things out of context. 3. Regarding this quote, On February 9, he announced on the forum that he had visited Marietta, Georgia. I didn’t announce this. Someone else announced that I was in Marietta for a social function. (It was a Valentine’s Day party). I simply made a stupid offhanded reply with the quote you provided. 4. Regarding what the judge ordered, please go back to the PPO. It says that “Respondent is hereby ORDERED to remove all posts relating to Ms. Ellis“, NOT the offending posts. I could have lived with removing the offending posts but the OVERREACHING comes from the order to remove ALL posts (including the informative non-offensive ones). You wrote, “The judge ordered Chan to remove the offending posts from the ELI website”. 5. Regarding the reference to the Marietta Daily Journal article, I understand why you linked to it. But it is GROSSLY wrong and I will be writing a rebuttal to that separately to the Marietta Daily Journal. 6. It’s unfortunate that I have been stonewalled from getting a copy of the court exhibit of the McCormack affidavit. It appears that everyone else can get a copy of this affidavit except me. I can’t barely respond to it without having a copy of it. 7. I also cannot emphasize enough the importance for us to attain the full court record including the exhibits. The court recorder has not returned my phone calls from 2 weeks ago despite my having left 3 messages at the judge’s office. I want to order and pay for the court transcript but I am being stonewalled again. 8. Oscar Michelen is NOT a part-owner in ELI. It is me and that is undisputed. It’s in the court record and in the PPO. McCormack has seen the PPO and it clearly states I am the owner and operator, not Oscar Michelen. Also, Oscar’s last name is misspelled. McCormack is trying to tarnish Oscar’s good name and reputation. I am the the stupid one who ranted, raved, blustered, and bloviated, not Oscar. He had nothing to do with it. To attempt to drag him in and file a state bar complaint against him for actions he is not responsible for is unethical for any lawyer. A lawyer is supposed to be held to a higher standard of conduct when declaring facts. McCormack is intentionally misstating the simple fact that I am the owner and operator of ELI, not Oscar. 9. And regarding the appeal, it looks like with great certainty I will now be pursuing an appeal given the fact that the plaintiff and McCormack are playing loose with the facts in a public media. They appear to want to go public. If we are to go public, all I ask for is balance and accuracy. I was thinking I might not make the effort or expend the resources to pursue an appeal to let the venom die down but it looks like I have no choice but to pursue it. I can’t have McCormack and plaintiff continue sharing their stories publicly with intentional distortions and inaccuracies. Winning the appeal and clearing my name is the most effective way to refute their claims.